We’ve updated the guide for Winter 2019! A couple of guitars that were becoming harder to find have been removed. We also added a couple of newer guitars that are great for kids, most notably the Fender Squier Affinity Telecaster (review coming soon). We also recently added the Loog Pro to this list, which is a little bit different from the rest (it has three strings), but it’s an incredibly cool instrument, and worth checking out – make sure to read our full review on it. 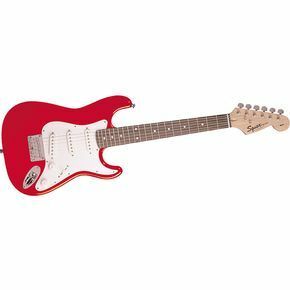 If you’re looking to buy a good electric guitar for a kid, there’s a wide range of options to choose from. From the cheapest toy brands up to the top of the line Fender or Gibson models, you can pretty much buy something for any budget. There are a few different things you will want to take note of when trying to select the best beginner electric guitar. Size, shape, brand, cost, and quality are all critical factors to consider when researching the perfect instrument for a particular child. Buying a guitar can be a pretty subjective thing, and experienced guitarists all have their own opinions, but choosing a quality guitar for a kid can be a bit confusing. That’s why we’ve come up with a buying guide: To help parents get the best electric guitar for their budget that includes everything you should look for. Read more of our electric for kids reviews. Sizing is essential when choosing an electric guitar for kids under the age of around 11. You don’t want to get an instrument that is too large for your kid, or they won’t be comfortable playing it. You also don’t want to get something that they will outgrow within a few months. Since a lot of kids start on a classical nylon string models, there isn’t the same kind of demand or market for electric guitars as you might find for classical in the smaller sizes. For the most part, kids won’t be getting seriously interested in learning the electric guitar before ages 11 or 12 and by then (in most cases) they can use a full-sized model, and your options are limitless. However, there are kids who are between the ages of 5 to 11 who want to play the electric, so it is essential to find them an instrument that is the right size. Realistically, there aren’t a lot of 1/2 size electrics produced by reputable brands, so if you want a good quality guitar, you should be looking for a 3/4 sized model. These guitars are usually called ‘Mini,” Traveler,’ or ‘Short Scale‘ sized. These are most likely going to be your best bet. As with buying a classical or an acoustic, there are some things that go into getting that perfect instrument. The height of the child is more important than age when choosing the correct size of the guitar. What accessories do I need to get? If you’re getting your child an electric, you’ll also need to buy an amplifier and a cable. These don’t need to be anything especially fancy, but you’ll at least need a simple 10-watt amp to make the instrument audible. A small practice amplifier starts at around $30 and up. A gig bag, strap, and tuner are also useful accessories to buy. Picks and a stand are also a good idea. A thin type pick is better for beginners; you might want to buy a few as they tend to get lost easily. If your child is developing an interest in music and is asking for an electric guitar, it is best to avoid the impulse to head over to Toys R Us or Walmart and pick up a cheap starter kit. A lot of the kits that you buy at the big box stores are hard to play and don’t sound very good. If an instrument isn’t easy to play it is very unlikely that your child will want to play it. Kids will quickly tire of trying, and the $50 to $100 that you spend on that guitar is wasted. If you get a high-quality instrument from a proper music company (not a toy company), your kids will know the difference and will have a much better chance of maintaining interest and motivation to learn. There is no reason to buy a child a guitar over $200, but you can get a great beginner electric around the $100 mark plus amp which you can get for around $30. The two biggest guitar companies are Gibson and Fender. Gibson is famous for their Les Paul and SG, while Fender is known for their Stratocaster and the Telecaster. They sell other body shapes, but these are their most popular. You can get these popular shapes for a wide range of prices. Fender owns a company called Squier that they use to put out cheaper versions of the Telecaster or the Stratocaster. These guitars will say “Squier by Fender” and they are a great option for kids. Gibson’s budget brand is called Epiphone, so you can get a guitar called an Epiphone Les Paul that is much cheaper than getting the premium brand, Gibson Les Paul. We wouldn’t recommend getting a Gibson or a Fender for a child, but rather some of the models by Squier or Epiphone would be a great choice. Ibanez is another big brand to have a look at, their Mikro model is a pretty cool choice for kids. 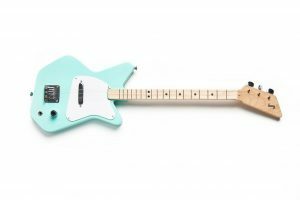 Jay Turser and SX are a couple of budget brands that do ‘copycat’ versions of Fender and Gibson models and were getting a lot of attention a few years ago. You can check out some of their models, but I would stick with at least a Squier by Fender since you can get them so cheap these days. Do I need to have the guitar setup? A setup means that you have a professional guitar repairman go over the instrument to make sure everything is working correctly. They check that the electronics work, that the truss rod is adjusted, the string action is playable, and that it has proper intonation. Some models are set up perfectly right out of the box and don’t need a setup, while others require a bit of adjusting to get everything working correctly. If you are buying from a music store, there is a decent chance they will have set up the guitar for you or you can haggle for a free or cheap set up with purchase, although this might depend on how much money you are spending. If you order online and don’t know much about guitars and how they are supposed to work and sound, it is a good idea to take it into a music store and ask them if it needs a setup. Hopefully, they will honest and not try to rip you off. A setup can cost anywhere from $25 to $60 plus, depending on where you take it and how much work needs to be done. If you do want your guitar setup, it’s a good idea to call around to try and find the best price. Realistically if you are spending $100 to $150 for a children’s guitar you can probably skip the guitar setup, kids aren’t going to care too much whether intonation is perfect and everything is adjusted correctly and it’s a bit crazy to spend $60 on a $150 model. You don’t have to spend a fortune these days to buy a very good instrument. With advances in manufacturing and technology, you can get a pretty decent instrument for not a whole lot of money. Although, when buying a guitar the more you can afford to spend, the better quality you will be able to get. You should also be realistic about just how important sound and quality are to kids; there is no reason that you need to spend more than a few hundred dollars to get them started. Most people agree that a reasonable budget for a starter instrument is $100-150. At this price, you will get an instrument that will most likely stay in tune, and you will be able to find something comfortable to play. If you buy a guitar that is too cheap, they tend to be challenging to play and don’t stay in tune, so it makes for a very frustrating experience for beginners. If you are buying for teen and expect the instrument to last a long time you should consider spending a bit more ($400 range). Should I buy a larger guitar so my child can grow into it? Generally, we wouldn’t recommend buying a make and model that a child can ‘grow into.’ You want to make the learning experience as easy and comfortable for the child, so a considerable part of this is buying the right sized guitar for the kid. There is no way that a 6-year-old is going to be able to play a full sized guitar comfortably. However, your highly motivated 9 or 10-year-old might be able to manage with a full-size model. The best indication of the size of the instrument that your child can handle is going to a music store and playing a few different sizes and models. Are different types of guitars harder to play or hold? It depends on the player. It’s always best to try out any instrument out before you buy. For children, you want to make sure you aren’t buying something that will be too heavy to hold. You also want to test out a few different body types to figure out what works be for them. 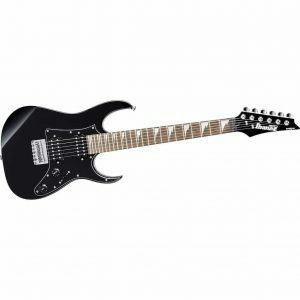 What should I look for when shopping for a guitar? Quality — Check the body for obvious flaws. Flaws can include things like jagged edged frets, lousy finish, machine heads that are hard to adjust. Straight neck — Make sure the neck isn’t warped. Pick the guitar up by the body and look down the edge of the fretboard toward the body of the guitar. It should be straight without any warping. Action — Action is the distance that the strings are from the fretboard. You can adjust this on most guitars a bit. Generally, you want to avoid guitars with very high action because it will be hard for your kids to hold the strings down. Tone — When you play a note, it should take a little while for the note to fade if it doesn’t do that you should try a different model. Playability — For most people, this is one of the most important things to look for. Does it feel good to hold and play? Are there any obvious problems that will hinder your child’s playing. What should I be looking for when I check guitar specs? Body Types– There are three basic types of electric body styles: the solid body, the hollow body, and the semi-hollow body. Most of the electric guitars that are good for kids are a solid body, which just means that it is made from a solid piece of wood. Pickups and Electronics– A pickup is what turns the vibrations of the strings into electrical current. The two main types of pickups are the single-coil pickup and the Humbucker pickup. Single-coil pickups can sometimes generate a bit of a hum while the Humbucker pickup was designed to stop the hum. (Hum-bucker, get it?). Guitars with Humbucker generally have a more powerful tone. A lot of guitars have multiple combinations of pickup (2 singles, two humbuckers, one humbucker one single) this just means that the player will have different tonal options. The way that the pickups are placed on a guitars body also makes a difference to the tone. Scale Length- The scale length is the length of the string that will vibrate and you measure this from the nut of the guitar to the bridge. For beginners and kids, you want a model with a shorter scale length because it is easier to play since there is less tension on the strings. Here are the general scale length measurements for the different sizes. (There can be some variation with these lengths on different models). Neck –The way the neck is designed can affect the playability of the instrument. For kids, you are going to want to look for a neck that is a little thinner than a standard neck, so it is comfortable for kid’s small hands to play. The neck includes the fretboard, that is usually made from a layer of rosewood or ebony, and sometimes maple. The fretboards have position dots or other markers inlaid in the fretboard so you can see what you are playing. Some specs list something called the neck construction, which just means the way that the neck is attached to the guitar. There are three different types of neck construction to be aware of: bolt-on, set neck, neck-through. Almost all guitars under $600 will have a bolt-on neck, which means that the neck is bolted onto the body. If you are looking for a beginner guitar it will in all likelihood be bolt-on. Tonewoods- Wood type can make a difference to the sound, although for most beginners the tonewood of a guitar isn’t a big factor when choosing a guitar. Here is a list of types of tonewoods you might encounter and what you need to know about them. Mahogany is a very common robust and dense wood used for most parts of the guitar. It isn’t a very hard wood, so it’s not used for fretboards and bridges. It is generally a reddish-brown color. Maple is the most used wood for making guitar necks and often used for fretboards. Rosewood is used mostly for electric guitar fretboards. It is quite dense and hard and comes in a variety of colors. Ebony is another very hard, dense wood that is used mostly on the fretboards of expensive guitars. It is usually black. Ash is a standard body wood that is used in solid body guitars. It is harder and lighter in color than mahogany. Alder is a little bit like ash but is not as expensive. It is light in color and commonly used on a lot of beginner guitars. Agathis is another wood that is used on a lot of the lower end guitars. It looks similar to alder. Nato is also referred to as Eastern mahogany. It is Nato is a durable wood, and you will find it on a lot of necks of more affordable guitars. Tuner (AKA tuning machines, or machine heads) are what you use to tune the guitar. They are attached to the headstock and are what holds the strings in place. You turn the tuners to adjust the string tension to tune the strings. The bridge is the on the lower part of the body, and it holds the strings in place on the body. There are lots of different designs of bridges, some that let you adjust the action (distance between the strings and the fretboard) by lowering or raising the bridge. The bridge has an effect on the tone as well as the general playability. Some of the links in this post may be affiliate links (meaning the site makes a small commission if you purchase an item that is linked).